He is dark and handsome. He likes technology but isn't a square. And OH the things he can do. This was one of my Mother's Day gifts from JohnnyMac. And I thought the Blackberry was slick and lovely. Mr. iPad, I heart you. You make me smile and are more than just a little addictive. This device is truly incredible. Outside of my iPod, the Macs are not a MAC family. A week before Mother's Day I upgraded my iPod to the iPod Touch and found it heavenly. But now I really need to be schooled on how to handle this big man of a machine. As I scroll through the endless applications and capabilities, all of you Apple experts are free to tell me your favorite apps. I am heading into the office, but of course, not until I spend a few more minutes with my new friend. Thanks for the beautiful gift JohnnyMac. I am sure Apple has the "How to remain productive at work while toying with all our gadgets" application and perhaps I should install that first. Yay for Johnny Mac! I can't help you with any MAC mojo. My iPod is the extent of my MAC experience (and even that only holds music... no photos or movies, etc.) The iPads look sweet though. Great gift. The Mrs. is not ready for one of those yet. I can't get her to even upgrade her basic cell phone. She is good at being frugal. Ooooh, handsome, knowledgeable and the very latest thing....me-likey! You are going to need a big book. Ya know one of those on your shelf full of uh, ya know legal mumbo jumbo and cut the pages out and slip Mr. iPad inside. That was a sweet gift. JohnnyMac making me look bad. That's impressive. I only have an old-school Ipod nano so I'm no help at all. Enjoy! We have had nothing but Macs starting way back in the 80s but they were called apples then. We don't have every little gadget though, just computers and ipods. ipad is on the list though. I don't know which apps are available on the iPad, I just have my iPhone, but I'll tell you my favs anyway. CameraBag, Dragon Dictation (hello! you talk, it types for you! ), Words with Friends, Pandora and Tweetdeck. I just want to play with one... once. We are abandoning our Palms for an iphone and I was JUST thinking yesterday....hmmmmm that ipad looks pretty cool! I am so jealous!That is an awesome Momma's day gift. Ohhhhh congratulations! I bet you are reading these comments on his back...stretched out in the palm of your hand. The way God and Steve intended it to be. Do they make these waterproof yet? I like to read in the pool. I just recently got an ipod nano. before that I just had the shuffle, so that is the extent of mac knowledge. A few friends and I were discussing the Ipad yesterday and comparing it to the kindle and other readers. I think the ipad wins and I want one! congrats...great gift! Im thinking of selling my kindle for one..I just got kindle for xmas...I feel greedy...but I think I can talk myself out of that...I cant wait...EnJoy Yours and have fun...! What a fantastic gift! Way to go, Johnny Mac! I have an iPod touch and a Mac Book Pro, so I didn't think I needed the iPad. However, the more I hear and read about it, the more I seem to think that I could definitely use one. Have fun searching for apps! I lose track of time when I'm browsing through the itunes app store. 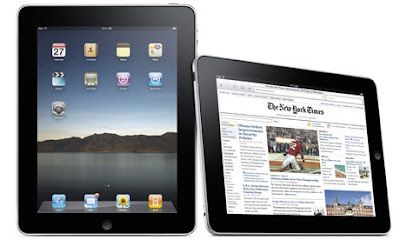 I can't wait to hear more about what you think of the iPad - my husband has suggested that I get one. I need something as right now when away from the computer all I have is a pay as you go phone that makes calls and allows me to text and that is it! YOU are a lucky lady! I heart Mr. iPhone, he is never far from my hand, so I can only imagine the fun things Mr. iPad can do! Tell us all about it! I purposely steer away from our Apple store because I KNOW I would buy one of these in an instant. Forget the mortgage, forget the kids tuition...I want Mr. iPad. But I DO have an iPhone, so life ain't all bad. My birthday's coming up....just maybe I might have someone as thoughtful as JohnnyMac? I don't any sort of i-anything. But I want one. Oh Jenny. I am jealous! Jphnny Mac might just be too when he sees how much you love your new toy! I'm so jealous! However, I don't really even know what it does, so I'm not sure why I'm jealous. I just know that I should be so I am! Oooo. I am such a Mac head. I have two iPods, an iPhone (my husband also has one) and I looooove my iMac. My husband and I have been drooling over the iPad...but alas, we just can't justify the expense right now. Oh enjoy! I love my iphone to pieces so I'm sure you'll enjoy the iPad! As for apps, I really like Yelp, The Weather Channel, and Facebook. Yes, I am unoriginal! I just played with your new boyfriend at the store. cool. v. cool. I got a MacBook for Mother's Day. I'm not so sure why since this has been a PC family. And sadly, Hubs spent the weekend transferring files and pulling out what's left of his hair. It's still not working right. I think I like your present better. I'm going to have to 'service' my husband endlessly for the hell I just put him through. Meanwhile, JohnnyMac is probably getting 'serviced' anyway for such a cool and easy gift. He's really smart that man of yours. Have fun with it-- and keep us updated. Some day we might get one, too. How fun for you! That JohnnyMac is a keeper. Im so jealous...look at his curves, he gets me all excited! Okay if it's got an emotion app I'm getting one. You can get all the major news forums and great apps for traveling too. I love my Mac laptop & am dying for an iPhone (fingers crossed it comes to Verizon soon!!). And I want to try one of these at the Apple store! Very cool! I am so behind with technology - just started texting this year! I did just get a Kindle for my bday and that was really exciting. I'm so technologically retarded my iPad is an Etch-a-Sketch. Does yours have the "Pong" app? Cuz I've heard that's an amazing feature. Yeah, listen to the previous 37 commenters; unlike yours truly they actually live in the 21st century. sounds like you and mr. ipad will be getting to know each other well...LOL i had the opportunity to play around with one in the store the other day and thought that it was quite interesting. i wasn't expecting it to be as heavy as it was, though it definitely wasn't too heavy by any means. i am a MAC woman, but i have yet to really feel the urge to go out and buy an ipad - that's probably because i haven't spent much time with one ;-) please let me know what you think of it as you and mr. ipad get to know each other better. have a great day! "ONE" of your MD gifts???? I say don't let anything get in between you and JohnnyMac. He is one helluva guy. I think you definitely need to write a post chronicling what you do with the iPad throughout the day. I still don't understand what they do. I agree with Sara P. I want details! I recently looked around, and decided on a netbook over the iPad, and for several reasons. So far, I like it. Very cool. I have an iPhone that I adore. Does JohnnyMac have a brother??? lol! Congrats on the awesome mom's day present! I think the iPad is sweet, but there is no Adobe flash on the system. So, I'd just leave Mr. iPad on the shelf because of this. Seriously? Who doesn't include Adobe flash? I am so looking forward to the day when I can afford this gadget. Ever since it was announced I wanted it. I have the Kindle for the P/C and now I want this upgrade! Congrats! And ayep, love mine too (mine was a birthday gift). Can't really give suggestions for iPad apps, since I still use my iPhone (Littlebit family = very Mac. 1 iPad, 2 iPhones, 1 Touch, Macbook Pro and iMac) much, much more. Lucky you. Send JohnnyMac my way. Hell, I might gay it up for an Ipad. ONE OF your gifts??? Lucky JennyMac! I'm typing on mine right now! I love it so much. It makes my laptop feel so antiquated. I haven't mastered much yet when it comes to the apps. I've been mainly using the book app. Fabulous, especially when flying. Not only does it cut out all the book bulk, I love the fact that I don't have to spread my arms wide to interfere with other passengers' arm room. I no longer have little ones, but my sister, who does, tells me many of their children's books are interactive with things that move across the page and all kinds of fun little tricks. I do love the video app, too. I've uploaded several workout videos. I'm really into the Bar method right now and I can just pop open the iPad and pull up a video, no problem. On the Mac site, there are several tutorials for different aps and things. I haven't sat down yet to check them out, but I'm planning to do it this weekend. I'm with you. It's such a lovely boyfriend. I'm totally jealous... my little bro said I wasn't allowed to get one. I should probably invest in a new computer first... Can't wait to hear more about it when you get all the fun stuff figured out! I, too am looking forward to having Mr. IPad in my life, he will be a wonderful edition to our lives. My son bought it and loves it! I only have the IPhone but I adore it - Dragon Dictation, Words With Friends (my friend and I have an on-going Scrabble game going) and so many more....ENJOY!! I do love me a Mac. I love my Kindle, too, but I may end up getting an iPad in the future, but I totally think they should rename it. Only a man would have named it iPad. Yeesh! Johnny Mac rocks! Happy for you. I just can't convince myself to get this....but it looks SOOO good! To meat or not to meat, that is the question. Maybe there is a market for CandyPorn?